There’s a reason Queensland’s Fraser Island is enticing nature lovers and adventure-seekers to its shores. Stretching 123 kilometres, it claims the title of the world’s largest sand island, and is brimming with remarkable sights just waiting to be explored. 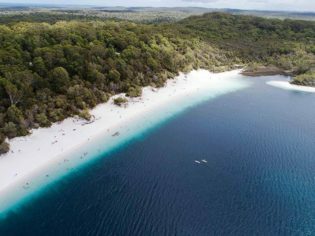 Fraser Island was inscribed on the UNESCO World Heritage list in 1992 in recognition of its natural values, ongoing ecological and biological processes, and as an example of superlative natural phenomena. The island’s pristine natural environment is characterised by vast golden sand blows, over 100 freshwater lakes, and a bona fide 75 Mile beach highway along the eastern coast. Now a world-class tourist attraction, travellers are escaping to this protected paradise to discover the diverse landscapes, and variety of great outdoor experiences the island has to offer, whether for a fun family trip, couples getaway, or an action-packed 4WD adventure. Take a dip in the alluring, aquamarine depths of the renowned Lake McKenzie, marvel at the crystal-clear water, and feel the soft white silica sand beneath your feet. This perched dune lake captivates visitors immediately with its picture-perfect beauty. Wander through lush palms, giant king ferns and soaring satinays, as pure water gently floats along the silent creek for a tranquil rainforest experience. It is one of the only places in the world where rainforests grow from the sand, at elevations of more than 200 metres. Traverse the 1,200 kilometres of sand tracks, explore the spectacular and ever-changing dune systems, and observe the abundance of wildlife species that call Fraser Island home. The journey is yours, and there are breathtaking moments at every turn. With world heritage wilderness right on your doorstep, the eco-friendly Kingfisher Bay Resort is the perfect retreat, with its award-winning design blending seamlessly into the island’s native surrounds, giving guests an immersive nature experience. Just 45 minutes from the Hervey Bay mainland, and nestled on the western bay of Fraser, Kingfisher Bay Resort is the ideal island base, with ranger-guided activities, and tours departing daily. After a day of adventures, guests can indulge in a cocktail pool-side, admire the stunning sunset along the beach, and dine at one of the various resort restaurants. Take some extra time to relax, and truly unearth the unique, natural beauty of Fraser Island, with this Stay 5 Pay 4 Deal. With hotel rooms starting at $169 (An average of $135 per night) and $279 per Villa (An average of $223 per night) it’s the perfect opportunity to plan your ultimate escape to paradise.